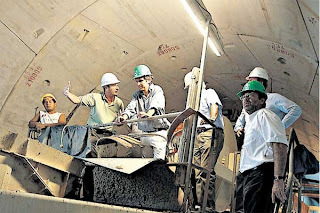 While neighbors and opposition legislators denounced irregularities in the largest hydraulic project in the capital, sustained advances to step excavation of one of the two channels provided reliever for the Maldonado stream, that will help prevent flooding in the neighborhoods of Palermo and Villa Crespo, on the axis of the Avenida Juan B. Fair, which will benefit one million residents. 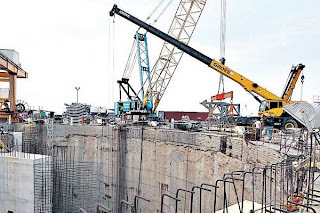 La Nacion ran the 700 meters and built the first tunnel is short, as work begins on the North Coast and was witness, aboard the TBM Valkyria baptized, how the huge drilling machine and remove the earth, while placing the blocks precast concrete more than 30 meters deep. 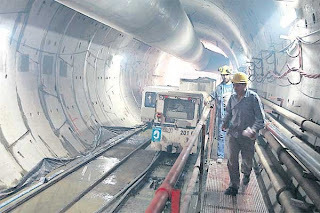 The first viaduct underground complex stretching from the Costa Salguero (flows into the Rio de la Plata) to the street Niceto Vega, Palermo, began on 21 May; reach the 4.6 miles and would take office in July next year. "This is a journey to the center of the earth, to quote Jules Verne, defined the Buenos Aires Urban Development Minister, Daniel Chain, as it descended by a staircase of iron and then climbed into a forklift to work to reach the shaft bottom, along with a group of engineers and the nation. There, the minister explained Chain one reason why the opposition resorted to court to stop the work, contamination of the aquifer Puelche (see separate release). "Here there are 35 meters deep and no more, as they say he (the complaint contends that reached 50 meters). We made modifications to the blueprint for the neighbors could enjoy 12 months prior to this channel," said the official. These changes would have sued the city an extra outlay of $ 12 million? 20 million dollars to the opposition? 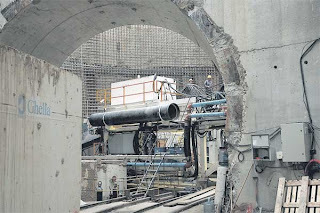 of the $ 209 million that the hydraulic project cost to the city, mostly funded by a loan from the World Bank. Sergio Agostinelli, Secretary of Public Works of the city justified the change in the original plans. "With the new well was improved methodology constructively secured the verticality of the work without error, overall efficiency was achieved in the Tightness; structural problems were eliminated and achieved greater efficiency in the ventilation in the assembly of the tunnellers and evacuation flows. With the original project would have worked in the first stage divers, underwater, with what that entails, "the official said. A path consists of an iron structure leads visitors and workers to the end of the tunnel, which is 6.9 meters in diameter, is ventilated and has an artificial light to reveal any detail of the work. They breathe air that is heavier than usual. "There are between 5 and 10 degrees warmer than outside. And in the future will be full of water," Agostinelli said, explaining the technical aspects of other complex for an ordinary observer. Something just draws attention in a timely travel site: have seen a sporadic trickle of water on a board. "Is this a loss?" Are consulted specialists. The answer is immediate: "No, this is something to adjust, a trivial issue that has nothing to do with a loss. Imagine the tunnel at this point we have the external water pressure on all the walls. And it's all dry. If had a loss would break everything, "Agostinelli said. He adds: "Some pools of water that are seen here is due to clay mud and cleaning of tools. Pricked aquifer not Puelche, as they say, nor is there any risk of contamination" . Some 400 workers divided into four shifts (2400 hours used per man-day), work day and night in the relief channel. The TBM Valkyria not rest. 16.50 meters per day progresses linear; 1600 m3 of earth removed, placed 11 rings of precast concrete 1.50 meters; consumes 3500 watts of power, 450 kg fat and 70,000 gallons of water used for cooling ( see graphics). The walk about six blocks from underground, which spans the track of the airport and Lugones Avenue, ends at the tail of Valkyria, a huge machine that is 105 meters long. The engine noise is deafening at times. On board the machine, to feel how it moves forward, pulling small, perfectly located as precast concrete blocks. "The head is 30 meters and serves as a stopper to the water in front. In the event of an accident, in this structure should get closed operators," said Chain, which shows a sort of closed metal casing. Both the Minister and the accompanying engineers contend that "there never was a collapse or landslides," nor broke the machine, which is monitored in vivo, not only from the command center set up in Costa Salguero, but also from Italy, where the company Ghella, who carries out the work, monitoring the excavation. "Today we are working with a 95 percent safety against unforeseen events," Agostinelli said. This hydro megaprojects? As the city is now the largest program developed in South America? was exposed last year in the 5th Iberoamerican Congress of Engineering, Jalisco, Mexico, among other congresses in Argentina. 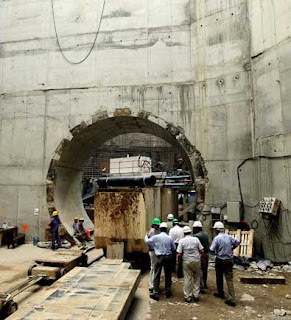 Maybe the government reported Macri, was selected for the International Congress of tunneling to be held in 25 to 27 this month in Federal District, Mexico. "Any expert who knows the subject can verify what you see here: this is perfect relief channel and no environmental contamination by the work or were overpriced in bidding. Are all matters for political reasons," said Chain. WHY WOMEN CAN NOT WORK? Agarrate Catherine was announced for the 21, but is desired. Meanwhile, in the stage of the stadium Liverpool, one of 16 that were built in the city, the boys run, the greatest drink mate and the sausages taste the atmosphere of the theater open. Finally came the Catalina, as they call the street band, one of the most important Uruguayan Carnival extensive lasts 40 days and continues until mid-March, and calm was revolutionized. Murgas arouse passions, have swollen, like football teams, there passes from one to another, merchandising and televised presentations from this year, live on open channel. Even to the leading brands advertise carnival, like the World Cup, like Coca-Cola, starring murguistas. There are no dancing girls or sculpted wearing feathers and sequins. Nor samba and disorder. Murgas, born in Cadiz and readjust rioplatense style, keep that spirit of political and social critique, that dilute it a bit more left since joining the government. There are 17 people (mostly men) who make a lengthy presentation, a kind of chronic sung with the highlight of the year. Uruguay Carnival is a spectacle. Popular participation was lost in the times of dictatorship but since the Administration is trying to recover gradually. Although passive, Carnival announces more viewers than football. Each summer 800,000 people attend some of the proposals in the calls, the stages and the Summer Theater. But perhaps the calls, a big parade to pure dance and Candomble, as attractive to visitors, it really is spoken these days in the streets of the city is the performance of each of the bands. The prudish, Queso Magro, Tanners Fungi, The Key, assailants with Contramano Patent and A, the last champion, are among the 23 that participate in the competition and leave through the stages. Moreover, the complex Uruguay Carnival troupes consists of lubolos, magazines, comics and parody. Each class participates in an official tournament rules and jury at the Teatro de Verano, Rodo Park. The Carnival is coming out in Montevideo summer stars, but some make the murga his life. Eden Iturrioz not hesitate to define his career as murgas. Is 40 and a 30 that leaves at Carnival, but continues throughout the year: "I teach murga. From this year the Carnival will be part of school subjects," has to prove he's serious. 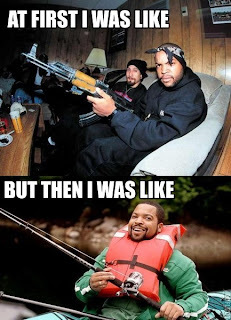 This year comes with patent assailants, but went through several. The Catalina is one of the murgas raging in Montevideo and the few who crossed the river and walked almost all of Argentina with their presentations. Also rose to other places in America, even in Cuba. In the past seven years won the competition three times and is among the few that remains after the king Momo takes for completion of the Carnival. Why the success? Before going on stage in Liverpool, including photos, autographs and kisses, Tabare Cardozo, stage manager, explains: "There is a bridge barbarian with Argentina because there will understand our jokes." Just the choice of themes more universal it easier for border Agarrate Catalina Cruz, Falta y Resto but usually occurs in Buenos Aires. This year the theme of civilization Murga is on, the Uruguayans and the usual rivalries with Argentines and Brazilians. She went off the presentation, the theater was silent and it was clear why always the favorite Catalina. A young man who was circulating as a companion on a motorcycle driver saved the life of a truck that was stuck on railroad tracks. The level crossing where there was an incredible event is located on Peru street on the edge of the seats of General Pacheco, El Talar, both Tiger's game. The white Fiorino van, like other reckless motorist, dodged the barrier was down and you want to cross the engine just stopped on the tracks. The bike with the 2 men watched the situation closely. The truck seems to start but it gets to stay and one man, the hero of Tigre, is incredibly low and pushes the truck to the other side risking his life for this unconscious motorist put at risk their own lives and those of third . The train almost wound, miraculously saves his life and remains, the first few seconds, stunned by the look of casual viewers. He realized that he returned to live. Celebrates with his friend who embraces him emotionally. Shout from the rooftops Yes, I did, I pushed it by myself and I saved it as resembling a goal celebration in the Argentine first division soccer. To celebrate the passengers of the train. The unconscious and the hero never met. The Municipality of Tigre camera that recorded the situation identified the motorist who is disrespectful intensive search for Tiger Operations Center to pay for their lack. More than 330 cameras monitor the different points of Tigre which allow police to stop criminals, detect fires and accidents or take pictures of reckless drivers and a hero in this case. When choosing the destination for holidays, more Argentines decided to deepen their learning about wines and visit some winery. The alternatives are many, both in Argentina (Mendoza, San Juan, La Rioja, Salta and Patagonia), as in South America (Chile and Uruguay) or Europe, USA, Australia and South Africa, to name the major tourist destinations wine. 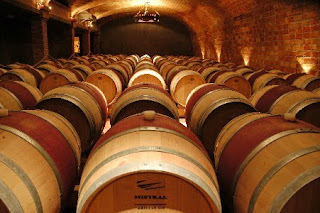 The celebrated journalist Miguel Brascó told a seminar on wines from the University of CEMA that when you visit a winery, the hosts usually offer a cup to each visitor to taste the wines. Those who work there separate people into two groups: those who know and those not, depending on how each one takes the crown. Needless to say that the second group often miss the best wines from the cellar. To prevent this, and you're selected among the contingent of "experts", take the glass by its stem or leg. Take it by the cup (the central part of it which makes container) is something that connoisseurs consider a "heresy" and immediately disqualified who does it. Better yet, take the glass by the foot, with your thumb and forefinger. This is what I usually do some experts, but should be careful not to spill, because this position so elegant works against the balance of the cup. If you want to make a better impression and fully enjoy the taste when you serve one wine, its aromas should aspire approaching the nose to the mouth of the cup without disturbing contents beforehand. Then with a flick of the wrist, turn the wine in a circular by the walls of the glass to release aromas, repeat this process several times. Now we're in a position to be invited to taste the best wines from the cellar. "Palermo has 80 percent of the ticket to the World Cup in South Africa"
Although the Argentina came close to losing to Jamaica, which would have been an unusual defeat, Diego Maradona, the national soccer coach, agreed with his team's performance in the victory by 2 to 1 and again commend Martin Palermo, partial order of the draw. "Of those who played today, I liked most was Palermo, who has won 80% of the ticket to South Africa," said Maradona, after the meeting. "We know that Martin is miraculous for the 20% that is missing has to maintain its level in Boca", he said. "Participation: How to evaluate the performance of selection and what aspects should improve the team? Shared your opinion"
"We also played very well Monzon, Galeano fell short of the circumstances," Maradona praised two men for the defense. "The selection Argentina needs these games to know where we stand," said DT on the importance of this kind of friendly. "It has to win, there were many people behind them, but we had possession. All the boys met the orders. With line three counter-attacks do not suffer from them. I'm very happy because we were never looking weak" , analyzed the match Maradona. 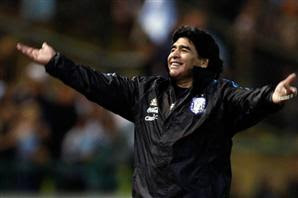 "I was also the people, who deserve a thank you for not whistle the Argentine team and I like being me," Maradona closed.